As exciting and nerve-wracking as it may be, an intern's first day can be a monotonous affair, filled with tours, training and HR paperwork. But as an intern in the Management Development Program at Securian Financial Group in St. Paul last summer, Tannyr Heyl, '15, had a slightly different experience. "The first day we received a schedule from HR that included the Backstreet Boys concert, a volunteer event at Feed My Starving Children and a meeting with the CEO," Heyl said. After spending her first week getting to know the company and her four fellow interns, Heyl was assigned to the communications department, where she performed many of the same tasks as a full-time employee. Helping start the company's Life Insurance Awareness Month campaign. Writing an article for a weekly online magazine for financial advisors. Working on advertisements. Assisting in the planning and implementation of the North Star 25 Dinner — an event for Securian employees and retirees with 25 or more years of experience that drew its highest attendance ever. These are just a few of the projects she completed there — all while collaborating and networking with people from various areas of the company and learning the lessons they share. "It think it was great preparation for my future," Heyl said. "I received firsthand experience in the corporate world and worked on projects the company actually used. It's a great feeling." A great feeling that was enabled, in large part, by her experience at CSS. Heyl, a management and public relations major, had taken a career planning class at CSS, which taught her the basic networking, resume building and professionalism skills she'll need to succeed in her career. But the class did more than teach these skills. It helped her apply them through a series of career events — including an information session with Securian. At this session, Heyl met CSS alum and current Securian employee Sophia Rubbelke, '13, and signed up for an on-campus interview. To prepare, she sought the help of Carrie Taylor Kemp and Mary Anderson in CSS's Career Services department, who suggested questions to ask, offered interviewing tips and even advised her on proper interview attire. It worked. 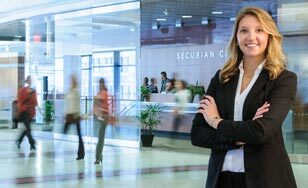 Heyl landed a second interview at Securian and, eventually, the internship — making her the first CSS student to enter their Management Development Program. But as valuable as this assistance and these classes were for her, they weren't the most critical aspects of her preparation. Read more about Tannyr's experience as a student and intern in her blog. What else are CSS alumni doing with their degrees? Check out our Alumni Success Stories to find out. Northforce is a local nonprofit organization that helps young professionals in the region connect with employers. Learn more.